Ciutat Vella has been added to your itinerary. Step off the beaten path and head to El Barri Gòtic and Castillo de Tossa de Mar. Get some cultural insight at Casa Batlló and Casa Milà. Change things up with these side-trips from Barcelona: Salou (Illuminated Fountain & PortAventura World) and Vila Vella (Old Town) (in Tossa de Mar). And it doesn't end there: make a trip to Park Güell, pause for some serene contemplation at Barcelona Cathedral, admire the local landmark of Magic Fountain (Font Magica), and steep yourself in history at Güell Palace. To find more things to do, traveler tips, other places to visit, and tourist information, refer to the Barcelona trip itinerary maker. Hobart, Australia to Barcelona is an approximately 33-hour combination of car and flight. You'll gain 9 hours traveling from Hobart to Barcelona due to the time zone difference. In August, Barcelona is much hotter than Hobart - with highs of 34°C and lows of 25°C. Cap off your sightseeing on the 14th (Mon) early enough to travel to Prague. Prague Astronomical Clock and Prague Castle will appeal to history buffs. Step off the beaten path and head to Old Town Square and Castle District. Change things up with these side-trips from Prague: Kutna Hora (Ossuary / The Cemetery Church & Saint Barbara's Church). There's still lots to do: take a stroll through Old Town (Stare Mesto), steep yourself in history at Old Jewish Cemetery, admire the landmark architecture of St. Vitus Cathedral, and get engrossed in the history at Jewish Museum in Prague. To see other places to visit, photos, ratings, and tourist information, you can read our Prague itinerary maker. You can do a combination of train, flight, and bus from Barcelona to Prague in 5.5 hours. Other options are to drive; or take a bus. Prepare for a bit cooler weather when traveling from Barcelona in August: high temperatures in Prague hover around 28°C and lows are around 16°C. On the 19th (Sat), wrap the sightseeing up by early afternoon so you can drive to Berlin. Your inner history buff will appreciate Charlottenburg Palace and East Side Gallery. Discover out-of-the-way places like Strandbad Tegeler See and Strandbar Mitte. Spend the 23rd (Wed) exploring the collection at Museum Island. There's much more to do: see the interesting displays at Pergamonmuseum, get a sense of history and politics at Reichstag Building, get to know the fascinating history of Checkpoint Charlie, and appreciate the history behind Berlin Wall Memorial. To find more things to do, where to stay, maps, and other tourist information, read Berlin travel itinerary planner. Traveling by car from Prague to Berlin takes 3.5 hours. Alternatively, you can do a combination of bus and flight; or take a train. In August, daily temperatures in Berlin can reach 28°C, while at night they dip to 17°C. Finish your sightseeing early on the 24th (Thu) so you can travel to Amsterdam. 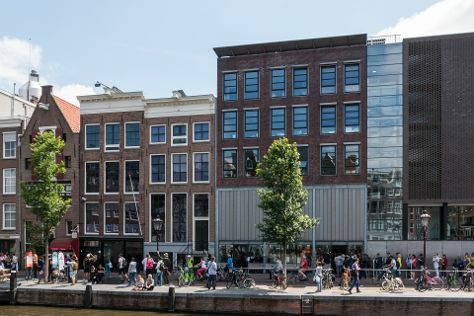 Visit Anne Frank House and Rembrandt House Museum for their historical value. Do some cultural sightseeing at Van Gogh Museum and Red Light District. Get out of town with these interesting Amsterdam side-trips: Haarlem (Grote Markt & Sint-Bavokerk (Church of St. Bavo)). There's still lots to do: admire the masterpieces at Rijksmuseum, pause for some serene contemplation at De Duif, get to know the fascinating history of Brouwersgracht, and take a stroll through The Jordaan. For reviews, maps, ratings, and other tourist information, use the Amsterdam trip planner. You can do a combination of bus, flight, and train from Berlin to Amsterdam in 4.5 hours. Alternatively, you can drive; or take a train. In August, plan for daily highs up to 25°C, and evening lows to 16°C. On the 28th (Mon), wrap the sightseeing up by early afternoon so you can take a train to Paris. Eschew the tourist crowds and head to Fondation Claude Monet and Champagne Alain Mercier et Fils. Popular historic sites such as Palace of Versailles and Eglise Sainte-Radegonde de Giverny are in your itinerary. The adventure continues: explore the world behind art at Louvre Museum, don't miss a visit to Eiffel Tower, step off the mainland to explore Île de la Cité, and see the interesting displays at Musée d'Orsay. To see traveler tips, more things to do, maps, and tourist information, refer to the Paris itinerary planner. Traveling by train from Amsterdam to Paris takes 3.5 hours. Alternatively, you can do a combination of train and flight; or drive. In August in Paris, expect temperatures between 28°C during the day and 16°C at night. Finish up your sightseeing early on the 2nd (Sat) so you can catch the train to London. Do some cultural sightseeing at Buckingham Palace and Natural History Museum. Get some historical perspective at Tower of London and Shakespeare's Globe. Explore London's surroundings by going to Brighton (Brighton Beach & The Lanes). The adventure continues: pause for some serene contemplation at St. Paul's Cathedral, see the interesting displays at Madame Tussauds London, steep yourself in history at Hampstead, and wander the streets of Clerkenwell. To find reviews, where to stay, ratings, and more tourist information, you can read our London trip itinerary builder. Getting from Paris to London by train takes about 2.5 hours. Other options: do a combination of train and flight; or do a combination of car and train. The time zone changes from Central European Time (CET) to Greenwich Mean Time (GMT), which is usually a -1 hour difference. In September, daily temperatures in London can reach 22°C, while at night they dip to 15°C. Finish your sightseeing early on the 8th (Fri) so you can travel back home.